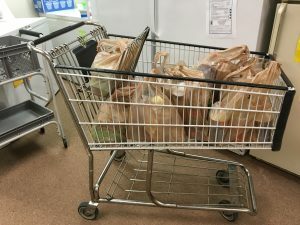 Open three times a week, Fauquier residents may visit the food pantry to select a week’s supply of groceries once a month. A family experiencing an especially difficult time can apply for additional assistance. What is the difference between a traditional food bank and the Fauquier FISH Food Pantry? Nutrition. The most economically poor are also the most nutritionally poor. Our volunteer staff purchases wholesome foods to distribute that include our signature DASH complete meal kits. This focus on nutrition helps to guide our disadvantaged neighbors towards making healthier choices. Following a complete overhaul and upgrade in 2015, the food pantry maintains a high standard. Our volunteers take every opportunity to coach food pantry clients on the benefits of eating nutritious foods and how it helps in the prevention of diet-related disease and can be Delicious, Affordable, Simple and Healthy. Healthcare providers are invited to refer their elderly and low income patients to us. Our volunteers will work with guidelines and dietary restrictions materials provided. Our most popular DASH meal kit recipe is Broccoli & Cheese Quiche. Get the recipe here.